Suppose a company had a revenue figure of €300,000 in July and currently has three salesmen: "direct", "organic" and "referrals". The MD hired a new salesman "PPC" in August who has promised great returns on investment (ROI) of greater than 10:1. There is a cost however of €100 per sales call. To minimise costs the MD set the salesman's PPC’s budget at 1% of overall monthly revenue, so his budget for August is €3,000 which works out at 30 sales calls. PPC salesman gets fantastic results, an ROI of 20:1 resulting in revenue of €60,000. Salesman PPC thinks he can double the number of sales calls for the next month and bring revenue generated by him up to €120,000. He will not get the opportunity. The other 3 salesmen didn't do as well so the overall revenue figure stayed at €300,000. The MD understood PPC performed very well but stayed with the formula of 1%. So PPC was restricted to just 30 sales calls for September instead of the 60 he had hoped for. This equates to a missed opportunity to have increased revenue by a further €60,000. Bookassist's John Braine discusses some better options for your browser start page to help you make the most of your browsing experience. This is the first of hopefully many blog posts I'll be writing which aren't particularly related to hotels or hospitality but will still be useful for discovering general tech tips, productivity tips, and web design & development advice and techniques. Having a good browser start page, for either your browser home page or a new tab, can bring you to your most frequently used web sites quickly, without typing into the address bar or browsing your favourites/bookmarks. I've toyed with a few start page options over the years but I've found a lot of them to be either pig ugly or not very useful. 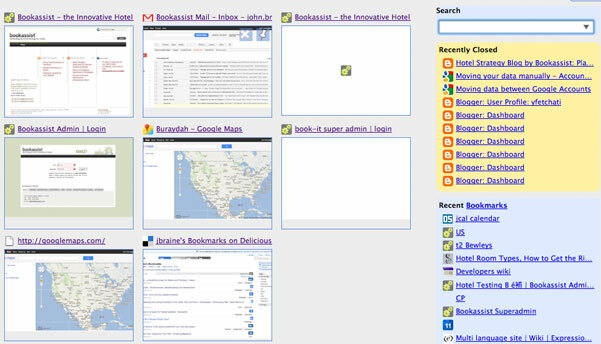 In general, widget-based start pages like myYahoo, netvibes and iGoogle tend to be front-runners in the ugliness stakes. A page full of widgets can quickly turn into an an eyesore, and you get sick of starting with a page that isn't so easy on the eye. Unless you really want news, weather, and stocks every time you open your browser or a new tab (I sure don't) you tend to use these start pages to jump straight to your email, in which case they're not very useful either, and setting http://gmail.com as your homepage is a better option, which is what I often revert to doing. Don't forget most browsers will give you the option of setting your browser start page and subsequent new tabs to different settings. So setting your homepage to gmail and subsequent tabs to a more useful start page, might be a good option. One start page I did like for a while was http://myfav.es/ but it's just that bit too minimal, and lacking some functionality that other start pages offer. It started off as fav4.org, with only four favourites on the page, but now you can add lot more. Though you can only choose from their list of options, so it can be a bit limiting. I tried symbaloo more recently but again I tired of the design very quickly, and Symbaloo is now on my ugly scrapheap along with the others. They really could do with a few themes to pick from rather then the one dated-looking design. A very useful option that a lot of these Start pages miss out on is a dynamically generated set of your mostly used, or recently visited web pages. And that's where plug-ins tend to work a bit better. 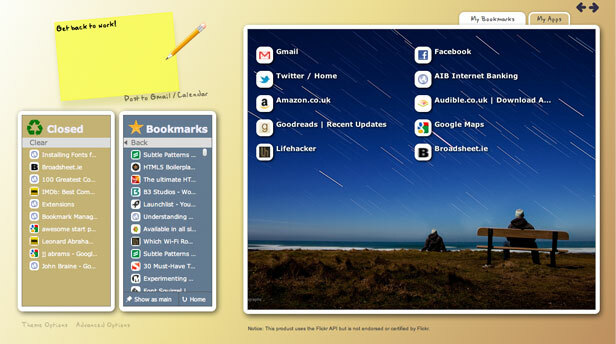 Which brings us to my current favourite choice for my start page - The Incredible Start page, a plug-in for Chrome. If you don't use Chrome, consider using it as I do; I use chrome strictly for personal use and Firefox for work. Many people assume they should only use one browser but using different browsers for different situations has many advantages. 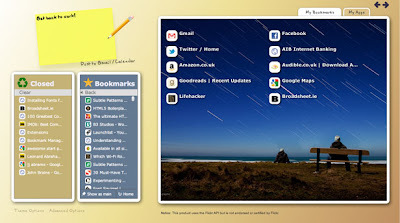 The Incredible Start Page ticks all the boxes for me; it looks good, it creates an editable list of links from your favourites, it has a column of recently used sites, and another for external bookmarks like Delicious. And it loads very quickly in a new tab. A similar plug-in available for Firefox is New Tab Jumpstart it has all the functionality, but unfortunately none of the eye candy. So - it's useful to set for the home page / new tab, but only a bit better than what you get with a new tab in Internet Explorer, or Safari. And it just adds a bit more functionality to the popular Speed dial plug-in for Firefox. There's a bookmark hack I've been using for years now that I find quite useful to keep a big list of favourites on display. It works on all browsers and is very quick and easy. If your bookmarks/favourite toolbar is displayed, right-click one of your favourites and select properties or edit. Then completely delete the title/name. Most sites that you use regularly will have an easily recognizable icon. So my recommendation is either use the Incredible Start Page with chrome, for your home page and new tabs, or in Firefox use my minimal bookmarks method above in combination with New Tab Jumpstart. And try to keep your personal browsing & favourites out of the way in a different browser. Irish hospitality operators, due in no small part to the celtic tiger decade, now preside over hotel stock that is of an exceptionally high standard and is rated as such. However service, delivery and the intangibles in many cases either exceed or fall below the hotels' designated star-rating. Far from being alone, worldwide the anomalies are even more stark. However Europe is playing a lead role in changing the status quo and seeking alternatives to the traditional approach to start rating. 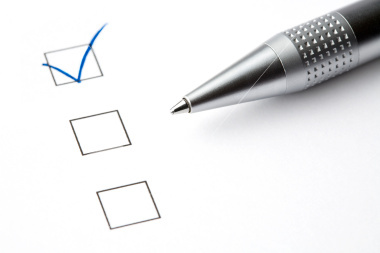 Old habits die hard and hotel rating systems even now continue to put great emphasis on ticking off big checklists resulting in a star rating. What matters to today’s consumer is very different than what general factors ratings organizations assume will matter. The meaning of "standard" has changed. Arguably, free Wi-Fi has more appeal now than whether a property has two restaurants or a lift. It’s not enough anymore to simply "Join the Conversation". Hotels should be tracking feedback, RoI and conversions with insight tools such as Facebook Insights, TripAdvisor’s Owners Center and Google Analytics among others. The next level up is a social media monitoring tool which collates and analyzes reviews across the web. TrustYou is one such analysis tool which Bookassist has integrated into its Reputation Alert suite of services. Used properly, a social media monitoring tool will help you turn guest feedback into a competitive advantage to be used to improve daily operations, organizational culture and best practice. The ultimate measure of a hotel’s quality may perhaps be assessed by posing the question "would you be willing to recommend it?". Are the current star rating systems best positioned to answer this or do guest review sites by their nature deliver a more compelling reply? Earlier this year the UK’s Tourism’s minister stated that the UK Government is considering phasing out government-sanctioned star ratings of various lodging accommodation in favour of traveler-written reviews. The idea may be a little before its time but it's a clear sign of the change that’s afoot.